In which I describe, but fail to explain, a compulsion for completeness. A recent (January 2014) piece on collecting by Damian Thompson in the UK’s Spectator magazine (dealing largely with his fifteen different CDs of Schubert’s last piano sonata) quotes research on addiction, “men disguise their shopping problem as collecting. Foraging and organizing purchases becomes more important than consuming them”. 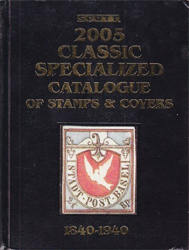 One of the main points of collecting stamps (and anything else, for that matter) is to assemble as complete a collection as is possible. 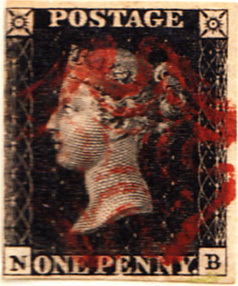 Militating against that aim, we all have our budgets and thresholds and mine are pretty low: I paid around $100 for a 3-margin Penny Black with my initials some time ago, but will rarely spend a tenth of that on any other first issue and less again on BoBs. They are, after all, only little rectangles of coloured sticky paper. 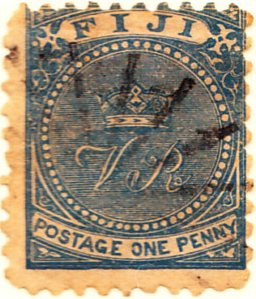 Others will be prepared to pay more or less, but a limited supply affects even the deepest pockets and so at most, only a dozen or so of us could own a Hawaii or Mauritius #1, even if we could afford to and the stamps were for sale. The economics of collecting undermines the urge for completism and alternative strategies must be found. I have a straightforward purpose in collecting and displaying stamps, namely to ‘show what they look like’, but have to reconcile that mission with the arbitrary self-imposed standard of only displaying items I actually own. ‘Owning’ an auction catalogue page with an image of an expensive stamp I could scan, or pinching an image from numones is not good enough: it has to be something more tangible (I cannot explain or justify this principle, it is merely a personal convention I am comfortable with). Fortunately, there are palliatives. 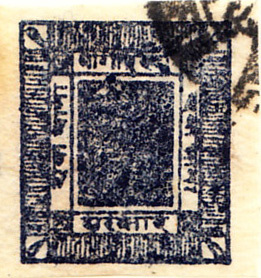 There are frequently later and cheaper variants, especially of the early first issues, and differences I cannot see (watermarks, perforations, paper types and so on) do not concern me: I do not distinguish unduly between Nepal's first issue of 1881 and the 1901 SG26 Sc23, other than noting that they look the same and one costs twenty times as much as the other. 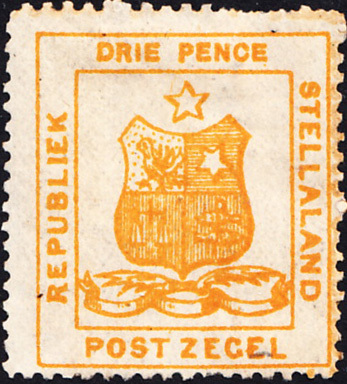 The cheapest stamp in the first set is acceptable, for example, Stellaland, where #2, #3 and #4 sell for about 10% of the #1 mint, though around the same used. The design is the same, only the colour changes. 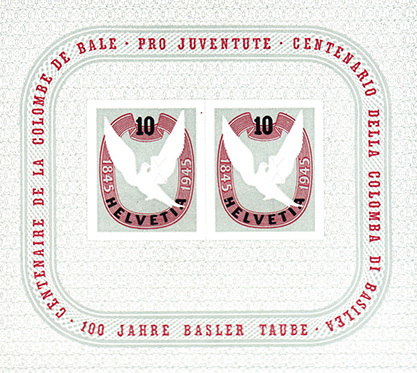 Displaying the appearance of the first issue is the main priority and many countries celebrate their firsts, often on the centenary and sometimes with a miniature sheet and so this is an ideal solution. The USA did so in alternative colours, apparently to deter fraud. All the miniature sheets on this page are shown half-size. The period celebrated varies, the shortest I have found being Rumania’s 74 years and Portugal’s 81 years. 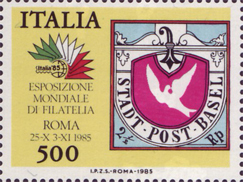 Major international stamp shows can also provide an excuse for reproducing famous stamps. An arbitrary standard I favour is that I would prefer the commemorating entity to be (or be related to) the original issuer. Exceptions can be made where necessary, the most bizarre example encountered to date being the St. Thomas and Prince Islands 1982 issue showing Cape of Good Hope’s first commemoratives (a Scouting theme showing Baden-Powell). I’ll have to settle for this as the original stamps are too expensive to buy, the 1900 centenary is long past and, in any case, South Africa is unlikely to celebrate a distant colonial incursion. The St.T&PI issue is listed in Scott but not in Gibbons which might explain why I cannot find one in the UK, so any help in obtaining a copy would be appreciated. In the meantime, I cannot show this strange stamp in a display, although one of the original CoGH stamps was used on the cover of the 2007 Scott Classic catalogue and that will do for this piece. 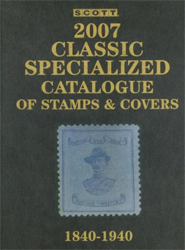 When all other philatelic solutions fail, I have been known to resort to the first-sensibly-priced issue (FSP), though this is not ideal: while it fills a space, it rarely fulfills the requirement of showing what the first issue looks like. 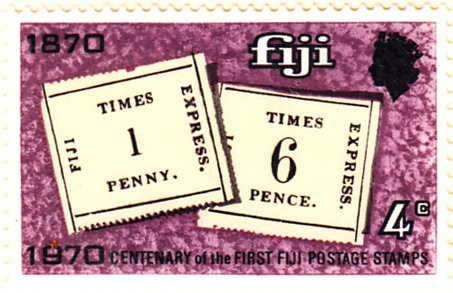 In the case of Fiji, for example, the expensive 1870 typeset first issues can be represented by the centenary commemorative, while the 1882 FSP, an attractive stamp in its own right, does nothing to capture the essence of the first. Another alternative, and the one which has given rise to this piece, is the cinderella and even more distant representations. Although I was alive at the time, I was either not brewing tea or not collecting stamps (or simply not paying attention) as I was not aware until recently of the two Twinings Tea card issues illustrating famous stamps. 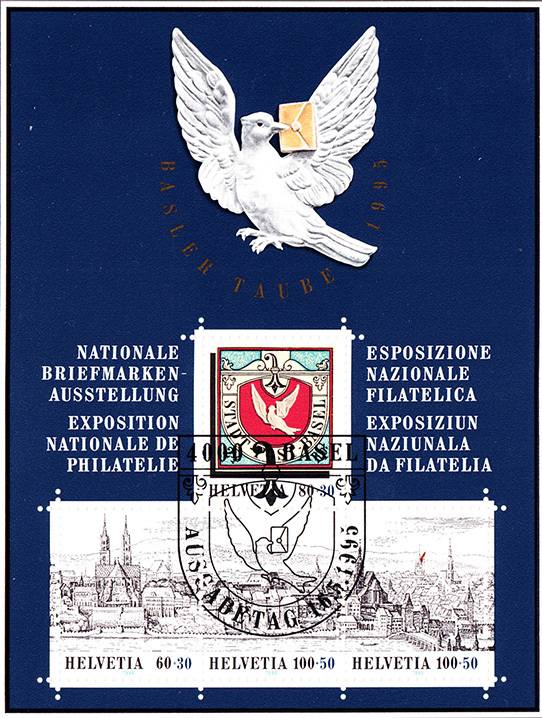 In 1959 and 1960 they issued sets of 30 cards depicting stamps, as selected by the stamp writers L.N. & M. Williams. 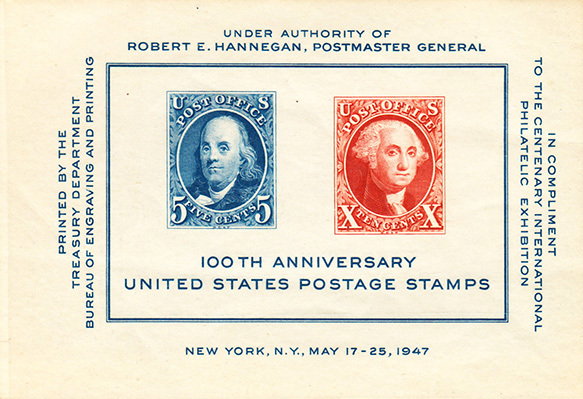 The stamps chosen range from minor printing errors to extremely useful rarities. 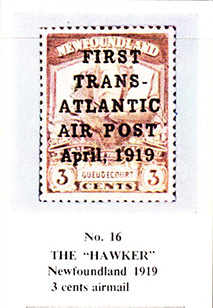 Perhaps my favourite is card 16 of the first set, showing Newfoundland’s first airmail, the utterly unaffordable 1919 overprint. It is possible that Canada will commemorate it a few years from now, but their track record on centenaries for the Canadian states has so far been abysmal, with the exception of the Beavers. The Twinings card tells the story, “Early in 1919 a prize of £10,000 was offered for the first non-stop trans-Atlantic flight. Hawker and Grieve made the first attempt, but came down in the sea and were rescued. Letters they carried bore these stamps. Only 200 were printed: examples are now worth about £500 each.” That was in 1960, the price in Scott 2008 is $20k/$15k. 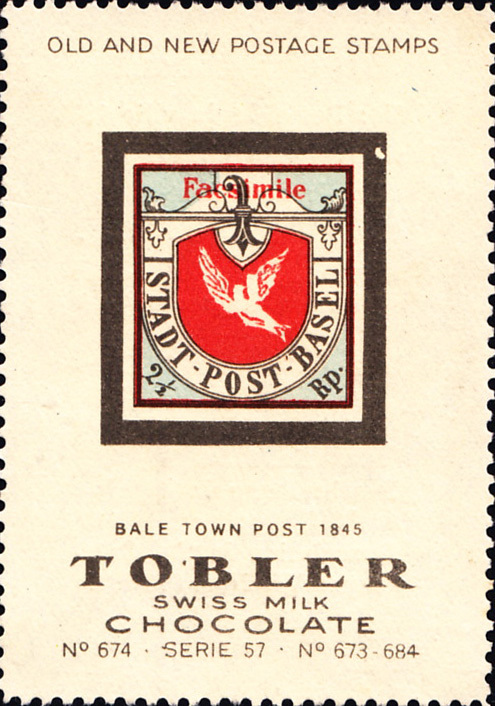 More recently, I found a set of 1920 Tobler chocolate stamp facsimiles on ebay. The production values for this set are far higher than the Twinings cards as they are in stamp format and lovingly printed (albeit with an unnecessary "facsimile" overprint on each). 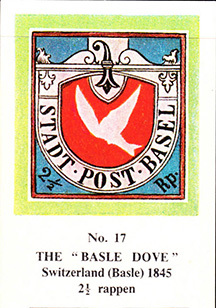 As Tobler are Swiss, it is no surprise to see the three cantonal issues featured and Basel’s beautiful first provides an illustration for all of the tricks mentioned here. A dull centenary m/s, a foreign stamp show, Twining, Tobler and eventually an attractive national celebration. Plus another Scott Classic cover. In summary, then, I seek to show the appearance of all the first issues but on a limited budget and so resort to alternative sources on which I impose illogical, arbitrary rules, perhaps in a perverse justification for doing so. Any suggestions from readers of other solutions will be welcomed.